In April I went to the Spring festival at the Fort Worth Japanese Gardens. Because spring in Texas is very often like summer elsewhere, I chose all hitoe (unlined) and summer items to wear--I even wore hemp tabi! I also made the choice to skip padding and the obi-ita because I thought they'd add more heat. This may be true but the obi-ita is really non-negotiable, I felt self conscious about the look of my obi all day. After that I ordered hechima (loofah) padding and obi-ita, as well as two synthetic, ro, shirring stye datejime (one with clips and one without). 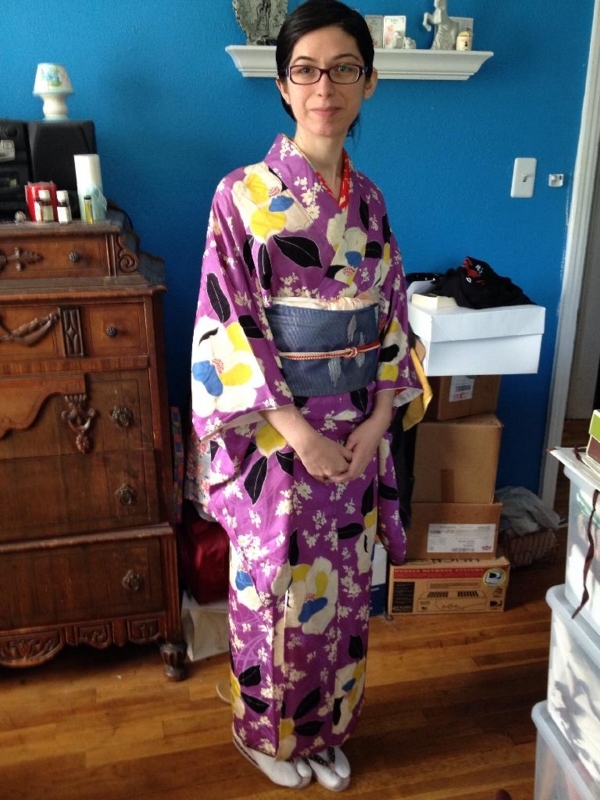 Both the kimono and the nagajuban are silk, Taisho pieces I found at a shop in Hawaii. The juban has red and turquoise bamboo with cream colored ume flowers on it and a wide collar (which is quite strange for a juban). 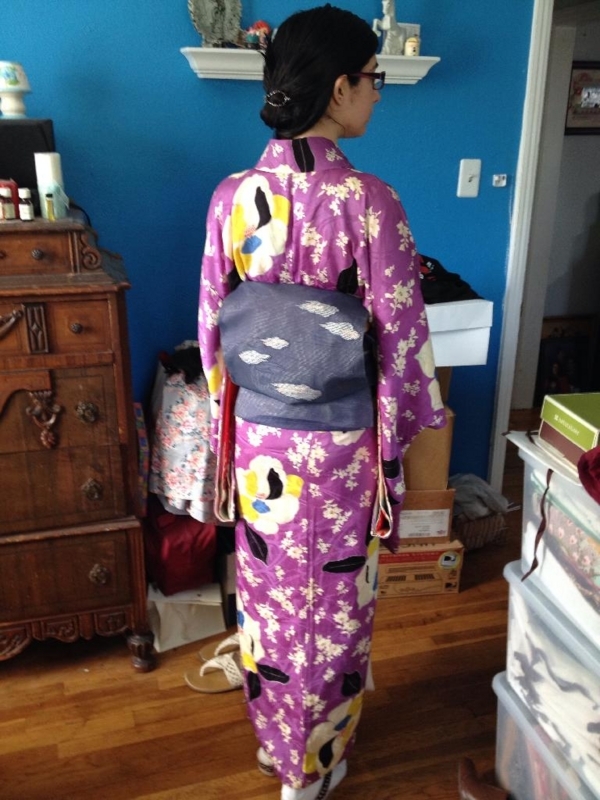 The kimono, on the other hand, has a half width collar which gave the collar area an unusual look because the juban collar was so much thicker than the kimono collar on top. Because the juban collar was already so thick, I decided to forgo the haneri. I like the combination of this very lively kimono with a more sedate navy blue, sha, Nagoya obi. I paired these with a red and cream obijime and a peach colored, rinzu obiage. The red echoes a similar red on the juban collar and there is a very tiny amount of peach on the design on the obi. Overall, I'm still quite pleased with this outfit. At the Festival I was a bit like a celebrity! There were so many people who all wanted to take my picture. I even noticed a guy sneaking a picture of me while I was watching my koto teacher and Mayuko-san perform! I think that was really rude, he should have asked. This made me so uncomfortable. Overall though, I had a great time at the festival.